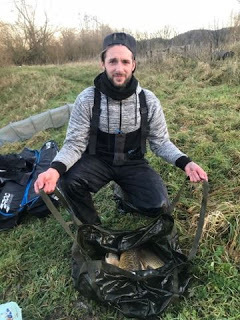 This time last year, I arranged a match out the pond which proved very popular with seventeen anglers fishing and I got asked by several people if I was doing the same this year but after lots of initial interest, there were only going to be a few of us so I was just going to fish Summerhayes on the Friday instead. To cut a long story short, the match was off then on again several times and to be honest I was getting a bit fed up with it (like I’ve said many times, who would be a match organiser!). 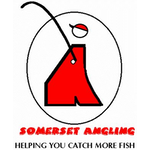 Harry then contacted me and said he was still keen to do something and suggested we fish his pond again to see if it would fish better than last time. It was more of a knock up to be honest as a lot of people had family commitments or were fishing elsewhere but I was just looking forward to getting out of the house. 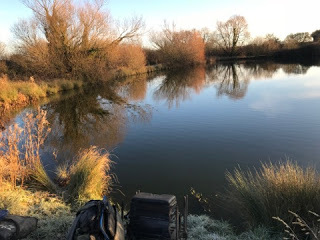 A hard frost greeted me in the morning but it didn’t actually feel too cold, we met at Cartgate for breakfast and with only a few of us fishing I had suggested leaving peg 1 out to try and make it a fairer match but the general consensus was to leave it in. Harry held out his hat containing folded up bits of paper and we all picked one hoping it would be the flier but nobody could bring themselves to look, then Jake spoiled the party by looking and admitted he had it. Okay, failing that, pegs 2 or 10 would do but Frank and Harry had those, Steve P was on peg 4 and not happy, I looked at mine and saw I was on peg 8, I was fairly happy even though it blanked last match as I’ve done alright there before. On arrival the pond was flat calm apart from several poxy cormorants including one that gulped down a pound carp while we were there but they didn’t hang around long. I set up the same rigs as last time, a 0.4 gram Drennan Carp for fishing two lines at 10 metres plus a 0.3 gram Drennan Margin Crystal for dobbing bread by the dead reeds to my left. Peg 8 and as far away from peg 1 as you can get! Harry whistled to get us under way and I put in a few grains of corn with some micros at ten metres angled to my right and a single ball of Bait-Tech Special G Dark with some dead reds at the same distance, angled to my left. I then dobbed some bread all along the reeds but never had a touch, Bill on my right said that Jake was already catching well on peg 1 and as suspected the rest of us were fishing for second place already. I gave it twenty minutes on the bread but was soon trying corn and then double dead red over the longer lines but much like the last time, the float rather stubbornly refused to go under. The first hour passed without so much as an indication so it was time for a quick walk. Bill hadn’t caught on peg 9 and nor had Frank on 10 although he said he’d briefly foul hooked a fish on the lead, I got to Jake and he’d had eleven carp already! 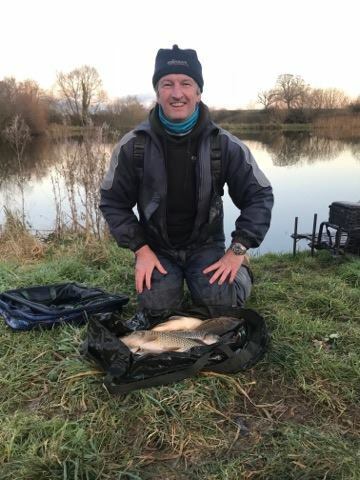 Harry had one on peg 2 and Steve P was still blanking so although first place was out of sight already, second and third were still very much up for grabs. While I was stood with Steve, Jake had carp number twelve and then Frank struck into a fish so thinking perhaps the fish had started to wake up, I headed back to my swim, as I reached Frank’s peg he was playing another fish which elevated him into second place. Sat back on my box, I tried the longer lines again but no bites and I had to try something else. Jake was catching by the reeds and Frank was blanking until he fished by the reeds so thinking that the carp were in any available cover because of the cold, the cormorants or both, I set up a Carpa 2 to fish by the dead reeds to my left, my only concern was that they both had a good depth by their reeds whereas I only had around two and a half foot in the corner by my dead vegetation. I shipped out with a piece of corn on the hook and toss potted in two grains and a pinch of micros, I lifted and dropped the rig every few minutes but no indications and it was starting to feel very similar to the last match here where I didn’t have a bite for four hours! I went to lift and drop the rig for the umpteenth time but I was snagged up and as I lifted, one of the reeds moved and then something started to pull some elastic out! I played the fish with kid gloves before netting a nice carp of 2lb or so. I’ve gone in again and after another five minutes, there was a sharp dip of the float before it submerged and carp number two was on. After safely netting it, I went back out ready for another but it didn’t happen. Bill still hadn’t caught and said he was going round to see how Steve was doing, he stopped to see how the others were doing and then spent ten minutes with Steve before making his way back, just as he was approaching his peg, a slow bite resulted in my third carp. 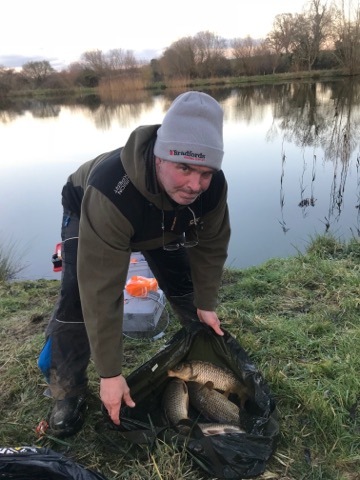 Bill reported that Steve was still blanking, Harry had two carp, Jake was still catching odd fish and Frank now had seven carp so although it looked like first and second places were already filled, third was still a possibility. I shipped back, tapped in a few micros and two pieces of corn and was just about to check my phone when the float slid away as carp number four took the bait. Then I had three more, one after another before the bites just stopped, I cupped in some more feed on the longer lines and went back to fishing by the reeds. 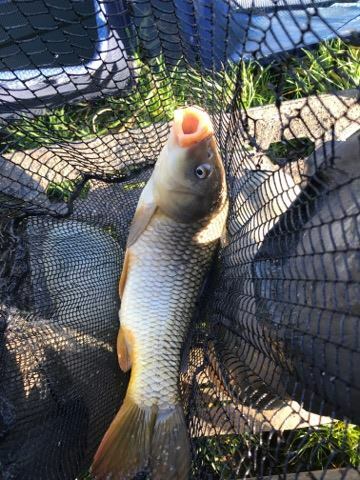 After about ten minutes, I missed a good bite but that was it, I tried punched bread and then double dead red maggot, I had a good bite but the strike resulted in a small rudd flying out the water. Just then Harry turned up, I went back to corn on the hook and shipped out, explaining to him how I had a purple patch with bites coming just after I’d tapped a little feed in from the toss pot, with that, the float sailed away and carp number eight was soon in the net. Two in the next two chucks and I started to think I could mount a late charge as Harry said Frank was on ten carp and Jake now had twenty but there was still an hour left. Harry left me to it but then I couldn’t buy a bite again, Bill was getting odd fish now and was up to four. I did try my longer lines again, mainly to rest my other line but I never had a bite so with half an hour left, I came back in by the reeds but no more indications until two minutes to go when I missed my second bite of the day and that was it. It got really cold in the last half an hour and when I went to pack up, the toss pot on my other rig was frozen to the ground! Frank shouted up to ask how many I had, I told him and he said he’d ended up with fifteen and Jake had twenty four, I knew they’d beaten me but hopefully I had enough to hang on to third place. As Steve hadn’t caught and Harry chucked back, we walked up to Jake and after several weighs his total was 65lb 7oz, Frank had 36lb 13oz which included some good fish, Bill didn’t weigh and then my ten carp (and a rudd) went 22lb 10oz and I ended up third and picked up £20. So quite an enjoyable day and it was nice to be out, I have to say thanks again to the Hebditch family for letting us fish the pond and I’m looking forward to fishing it again in the summer. 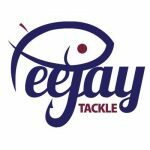 Well that’s nearly it for this year with just the IBC match on New Years Eve to go, there’s twelve booked in already including a new face as the popularity of the matches continues to grow and I really hope we can keep this going as it’s brilliant and testament to the great and varied fishing the clubs got.